Add instant character to any setting with the Helen Stacking Chair. This impressive modern chair is both fun and functional, as well as conveniently stackable. Whether adding style to a dinner party or used at the office, the Helen Stacking Chair gets the job done with style. The Helen Stacking Chair is made of anodized aluminum. which country is this chair manufactured? 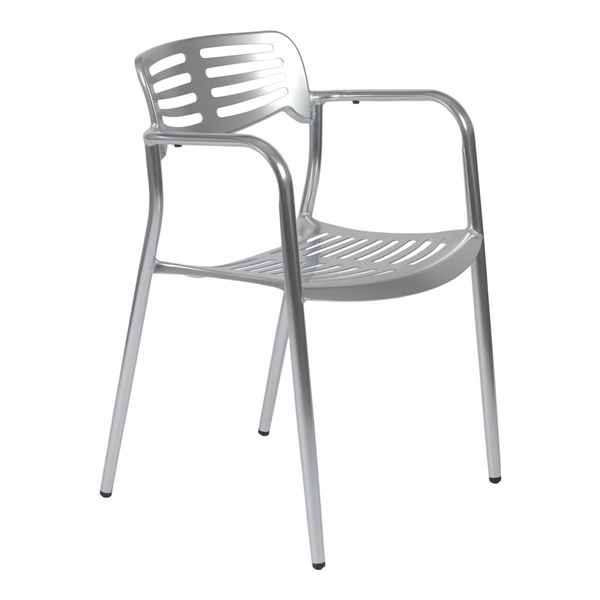 This looks almost like the Jorge Pensi aluminum toledo chair which I am interested in. This is a copy I suppose. Is this made in Europe or in SE Asia? Is the aluminum cast? Are these the same ones being sold y another on line store with reviews that after months, the exterior coating started peeling off? Please offer some reviews by customers. Thank you for your questions. This is in fact a replica of the Toledo chair. This particular version is manufactured by Euro Style. We have not had customers with issues with this chair but knowing the manufacturer may help you to see if these are the same ones that have had issues. These chairs are manufactured in China and are made from anodized aluminum.